Haven't updated +/- Crew numbers for a while. Partly because there hasn't been too much to cover but also because this season has been driven by who is available (vs a coach having to make tough decisions). We are 23 games in though and through all the muck we are starting to see which players are rising to the top with this metric (there are many, this is just one). • I think it's reasonable to ask questions about Parkhurst's role. It's clear he should be playing but his sometimes shift to right back is for a reason. Note; Barson. When Williams returns I'd like to see him back at CB and Parkhust at RB. Keep it simple, get points, be done with it. • Jimenez is missed. You usually see guys with a lot of minutes drifting to the middle but not him. It's very possible his injury absence is driving a number of other player's numbers. • Would like to see Viana some more. Not sure why he's not getting more time. His WhoScored ratings are off the charts (for a Crew player). 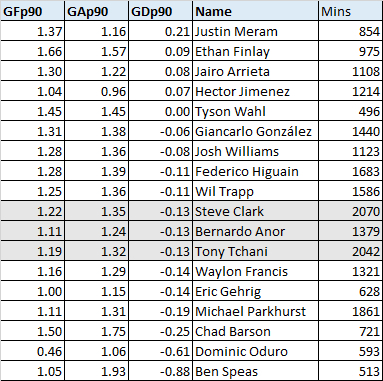 • I'll look at this again at year end along with going over my KRAMB metric (a players PPG + Goal Diff when starting). I don't expect a whole lot to change here with a dozen weeks left. Here are the extended stats for the players over 450 minutes.